It's been a while since I last had a London-based shoot for my blog. After traveling all over Italy in sunny dresses and shades, I was brought right back to earth when I arrived home to snowy London. I needed to revert back to my more practical wardrobe, let's say, which includes a whole lot of "comfy clothes" or "Athleisure-wear" as it's known in the FASHUN industry. From comfy women's joggers, to oversized sweaters and trainers, it's not hard to see the benefits of jumping aboard this trend. I think of it as being "airplane-ready, all the time" - looking great but feeling even better! This week I created a look that was based on the athleisure trend. I have barely taken these trousers off since purchasing in the River Island sale. I quickly decided that they will be my London to LA airplane clothes this week when I jet off. My aim is to look as put together as a celebrity stepping off their private jet... fingers crossed for me! Details and accessories are minimal and effortless. 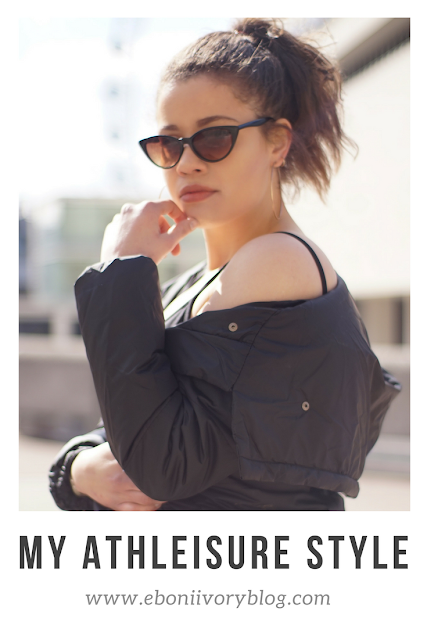 I experimented with these on-trend narrow cat-eye sunglasses that I picked up for pennies in Primark. I wasn't sure they would suit me but I loved the final result when paired with a sporty-luxe look. I also kept my signature gold hoop earrings as well as my Casio watch in a Nintendo-grey. I love this watch, it is my number one go-to for practicality and works well here. I love the mustard LOTD faux-leather biker jacket a lot. I must say, I haven't had much opportunity to style it up, but with the right outfit, it looks great! I paired it on top with a Boohoo cropped cami in a scuba material. Perhaps it is a top that should be saved for a sunnier day (perfect when I hop off the plane at LAX). I also tried a different jacket to give an even more laid-back vibe. Puffer jackets were huge last year an I picked up a cropped, hooded one. When taking away the pop of colour from the mustard, the look is automatically muted and a little more casual and sporty. I love these New Balance trainers. They are the most comfortable trainers I have ever owned and they go with so many outfits! I couldn't find these exact ones anywhere online so I have linked some similar. I have extremely strong feelings of love and lust towards athleisure wear. As I get older, the more important it is to look good and feel good. Gone are the days of blister-making shoes and super tight, mini skirts that are freezing and impractical. Time to get cosy! What are your thoughts on the Athleisure trend? Love it or hate it?